The Triplicane-based sweet shop is known for its Dum Ka Roat, a halwa delicacy which is crusty on the outside and hot and soft on the inside. Not too far from the dusty roads of Triplicane lies the secret to Chennai’s world famous halwa. 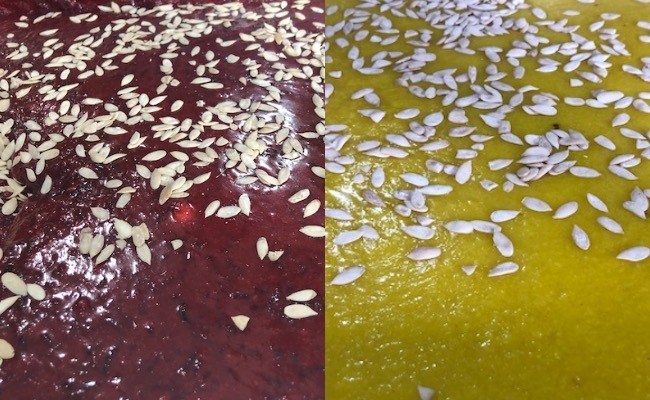 The Dum ka Roat, a glorious sweet born in the city has lured halwa lovers from different continents to Chennai, and in particular to one specific shop in Triplicane. Located on 9/2 Fakir Sahib Road, Basha Halwawala or Basha Halwa Kadai is an unassuming little sweet shop which has gained unimaginable popularity for its halwa. Having finished 80 odd years in the sweet business, Basha’s has dished out consistently mouthwatering halwas, day after day for decades. The shop sells 19 sweets in total including all-time sweet hits such as the flaming orange carrot halwa and bitter gourd halwa. The Kesar, Beetroot and Badam halwas too adorn the glass shelf alongside regular items such Paal and Pika Kova, Mysore Paak, Laddu (both normal and special varieties) Baadusha, Pedas and juicy fat Jangris. On the other side, flaky Soan Papdis cool on top of newspapers while Gulab Jamuns (another famed dish at Basha’s) have already sold out. The shop also boasts of a special dish called Ande Ke Mithai - a dessert made with eggs. “This is made very often in Deccani Muslim households. It’s like Paniyarams in Hindu houses,” Moinuddin Jalaal (32), owner of the shop tells TNM. Despite the wide range of sweets, it is the honey brown Dum Ka Roat which lures several people every day to Basha’s. Crusty on the outside and hot and soft on the inside, the dish also hold the pride of place in the heart of the Jalal family. Moinuddin says that it was his great grandfather, the eponymous Basha Sahib, who launched the shop and commercialised the Dum ka Roat. Before that, the dish was made in Muslim households on special occasions and festivals. “Basha Sahib started the shop right here nearly 80 years ago. Now we have expanded a little bit and increased our sales,” Moinuddin says. But contrary to what fans and patrons of Basha’s believe, there is no secret ingredient to the Dum Ka Roat sold here. The trick lies entirely in the baking of the dish - a process which takes 3-4 hours and quite a few helping hands. “We only add simple things. Milk, khoya, sugar, ghee and rawa (semolina) makes up the batter. But the secret lies in the way it’s made. The halwa cannot be even slightly undercooked or overdone.,” he says earnestly. Once the batter is prepared, the halwa is baked on a coal fired stove where it bubbles, thickens and browns into the right consistency. It is then sprinkled with musk melon seeds. The shops’ kitchens are almost completely run by coal-powered stoves. “We don’t use any electricity. The government gives 100 watts of free electricity and that’s about all we use,” Moinuddin adds. If prepared to perfection, the Dum Ka Roat can even be kept outside and eaten for a week without it getting spoilt, the serving staff add. Despite this tiny shop’s massive success, Basha’s has just the one outlet in Triplicane and no other branches. It is to this shop that heavy orders from Australia, USA and other countries come in from during season every year. A kilo of the Dum Ka Roat costs Rs 400. Currently, the outlet is being managed by Moinuddin’s father Jalaluddin who visits during the evenings. “Ramzan and wedding times are the busiest. Those times, business doubles as compared to what we sell on an average day. But we haven’t really expanded as Triplicane has been our business hub in the city and not so much the other areas. Besides, we haven’t found land that we could buy/use to expand the chain,” Moinuddin adds. Other than the old location, Basha’s has also managed to retain their old and very charming way of packaging. All the sweets here are sold over-the-counter in colourful cardboard boxes. There’s also a cotton string tied around it to hold it together. Empty boxes in candy pink, orange, green etc line the shelves of the shop and on top of the packaging is printed ‘Original Basha - Basha Halwawala’ - a message which hints that several other Basha sweet shops cropped up in the neighbourhood to eat into their success. As the clock ticks towards sunset, the Dum Ka Roat placed in the steel platter vanishes bit-by-bit into the empty boxes. And inside, Moinuddin is ready to end his watch once his father takes over their shop, but not before the new lot of sweets arrive for evening business.